Luke Puskedra’s 2:10:24 at Chicago drew most of the attention, but in that same race, another American stamped himself as a contender at February’s Olympic Trials. 32-year-old Kenyan-born Elkanah Kibet, who runs for the U.S. Army, ran 2:11:31 in his marathon debut to take seventh overall. Like Puskedra, it wasn’t always easy for Kibet to get to this point. 32-year-old* Elkanah Kibet has been running for over 20 years, but when he started out, as a child in the Kenyan village of Singore, runner was not the most accurate way to describe him. Courier would have been better. Or one-man delivery service. As the oldest of seven children, it was up to Elkanah to run from his family’s brick house to the shop when they needed meat for dinner. Or anything else, really. And right from the start, he took it seriously. Elkanah’s father, Thomas, would praise him if he made good time on the journey, which was about six miles, round-trip. That’s all the motivation he needed. Running quickly took hold of Elkanah’s life. A local coach caught wind of the boy making shuttle runs between his house and the shop. The two would race, Elkanah on his feet, the coach on his bicycle. At lunchtime, everyone in at Elkanah’s school would run back to their homes for lunch before returning for afternoon classes. And once again, Elkanah had good reason to run fast. Two decades on, time is more important to Kibet than ever. At the Chicago Marathon on October 11, Kibet, now an American citizen running for the U.S. Army, was one of the few men in the lead pack for whom time, not place, was the primary goal. So when he sensed that time slipping away — he wanted to run 2:10 — he took the lead. It didn’t matter to Kibet that there were still 22 miles left in this, his first marathon. Or that some of the guys he was dropping had run a full marathon faster than the pace of his half marathon personal best (64:01). All Kibet knew was that it felt like his goal was slipping away and he had to do something about it. Kibet raced out to a lead of 80 meters before the chase pack caught him at nine miles. For the next 10 miles, Kibet hung with the leaders, responding to every move. 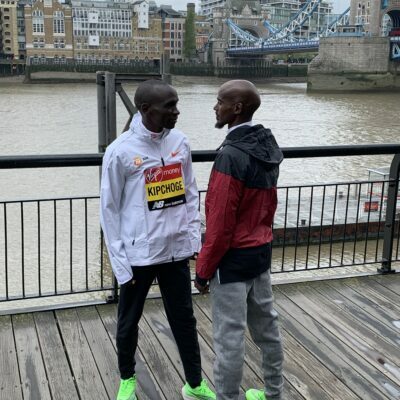 But when Dickson Chumba, Sammy Kitwara and Abera Kuma broke away during mile 20, Kibet was faced with a decision: respond, or hang back and wait until later to move. This was where Kibet’s inexperience came back to bite him. Kibet let the top three go as well as several men in the second group, which included Girmay Gebru, Sammy Ndungu and fellow American Luke Puskedra. Kibet had hung back during several moves earlier in the race, only for the pace to slow again, quickly reuniting him with the leaders. But this was the move; the top men had begun their long push to the finish, and when Kibet finally got going a few miles later, the gap had become insurmountable. Kibet wound up seventh in 2:11:31, the fastest debut for an American since Andrew Carlson‘s 2:11:24 in 2012. It’s a performance Kibet is proud of, but he’s just getting started. Kibet felt as if he had more in the tank when he crossed the line in Chicago, and aside from some tightness in his hamstrings, his body suffered no ill effects from racing 26.2 miles on the streets of the Windy City. The next day, he was back running 30 minutes easy, and he kept it up for the rest of the week. That’s not to say Kibet doesn’t take breaks — “If I feel tired and that I really want to rest, that’s what I will do,” he says — but the man loves to run and a light 30-minute jog is the easiest way for him to stay active, something he feels is important even when he’s not in serious training. The next date Kibet has circled on his calendar is February 13: the U.S. Olympic Marathon Trials in Los Angeles. Making the team will likely require around a 2:10, and Kibet is confident he can achieve that in LA and place in the top three. Reaching his goal, however, will require a change of scenery. Right now, Kibet is stationed at Fort Bragg in North Carolina as a specialist in the Army’s 82nd Financial Management Support Unit, where he closes out military contracts. Though Kibet generally works in an office four days a week, it’s far from your typical nine to five job. Wednesdays are training days – military training days – where tasks include marching, weapons familiarization, combat lifesaving — anything a soldier might be expected to encounter in the field. During his marathon buildup, Kibet would try to find a place to sit between drills in order to stay off his feet as much as possible. And none of Kibet’s opponents in Chicago had to deploy overseas prior to their buildup — from June 2014 to March 2015, spent time in Kuwait and Iraq disbursing funds to American soldiers. The brutally hot summers — the average high in Kuwait’s capital, Kuwait City, is over 105 degrees for every month from May through September — severely limited Kibet’s training, forcing him to run early in the morning or late at night. Though that was still better than when he was in Iraq, where the environment was not as safe for running. At one point, he was stranded at an FOB (forward operating base) in Erbil for a week, unable to run because the base was too small and his surroundings were deemed too high-risk. None of that was enough to prevent the relentlessly optimistic Kibet from chasing his dream. “I always try to say, ‘Okay you know what, you are looking for a better future so you better work hard. Don’t be lazy now, don’t say you are tired. Keep going.’ And then I go,” said Kibet. Kibet hopes that that better future is now. Several months before Chicago, he applied to be part of the Army’s World Class Athlete Program (WCAP) with the aim of training as a marathoner in preparation for February’s Olympic Trials. Acceptance into WCAP would allow Kibet to relocate (likely to Fort Carson, in Colorado) to a new location where he would receive coaching and be able to devote almost all of his time to training. Despite a 64:01 half marathon PB, Kibet’s initial WCAP application was rejected. 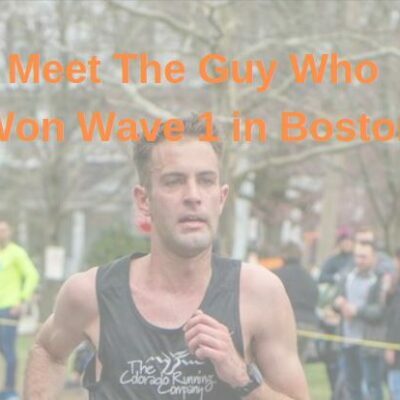 The WCAP standard for marathoners is 2:15:00, so he began looking for a race in the fall to hit that mark. He considered New York, but the hilly course and uncertain weather presented too many risks. Chicago was the obvious play. After running well under the standard in Chicago, Kibet sent in his new application to WCAP last week and expects to be accepted soon, which would allow him to relocate before beginning his Trials buildup. 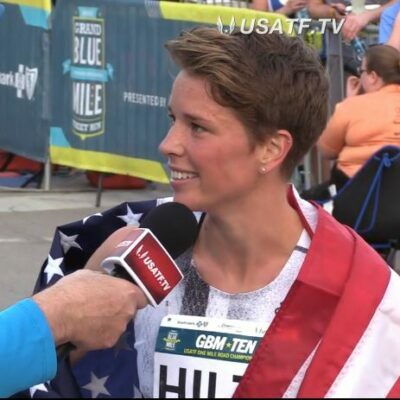 “Based on my experience with him, once he gets in the WCAP and his job is to train and run and he has a coach that regularly coaches elite athletes like him, it’s hard for me to believe he won’t run a 2:08 or faster,” said Capt. Rich Connaroe, who coached Fort Bragg’s team for this month’s Army Ten-Miler and helped to oversee Kibet’s Chicago buildup. Ask anyone who knows Kibet what he likes to do and you’ll get the same response: run. He’ll watch college sports on the weekends — particularly his beloved Auburn Tigers — but doesn’t have many other passions. Kibet just loves to run. So that’s what he does. A lot. Many athletes have taken the same path as Kibet, using running as a means to leave Kenya and earn a college education in the United States. But even if Kibet was still back home in Elgeyo-Marakwet County, he’d be out on the roads logging miles. Kibet says his body has become so accustomed to running that when he goes a few days without running, his legs start to hurt. 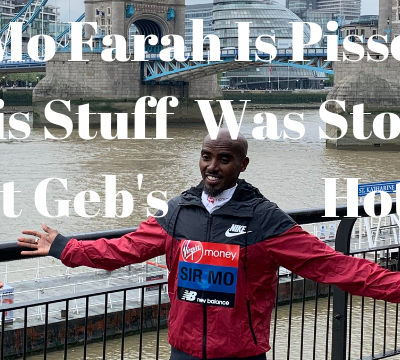 Indeed, if Kibet needed convincing to do something he didn’t want to, Chemase would simply tell him “Do this like you do running.” That usually did the trick. Elkanah started out running to the shop for his father, but he quickly developed a passion for the sport. 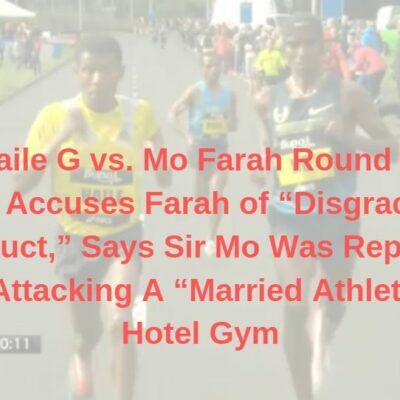 The coach on the bicycle whom Elkanah would race to the store told Elkanah he wanted to enter him in a race. Elkanah asked his father for permission; Thomas Kibet was a big fan of athletics and quickly granted it. Elkanah was destined to run, and his classmates knew it. Any time he would try to hop in their soccer game during recess, they’d shoo him away. “They would say, ‘Your legs are tiny, go run! '” Elkanah recalls. Elkanah fell into a rhythm, rising early to milk the cows on his family’s property before running to school. In the evenings, he’d have to study and make sure the cows were fed before going to bed. In between, he found time to run with some of the other girls and boys in his village, hoping to one day run like his idol, Daniel Komen. Pride was on the line during those sessions; it was embarrassing to finish behind a girl. But these weren’t your average girls: one of Kibet’s training mates was Vivian Cheruiyot, who would grow up to become a four-time track world champion (in August, she won her 4th track title in the 10,000 at the World Championships in Beijing). Running gave Kibet’s life a purpose and his weekly routine — farming, studying, running and church on Sundays — allowed him to excel while unwittingly preparing him for the structure of the military. As Kibet’s running career progressed, he dreamed of going to America and receiving a college education. His friend, Gilbert Kiptum, would attend training camps with foreign athletes who trained in Kenya, and Kibet asked Kiptum to help connect him with an American coach. It took two years for someone to respond to one of his emails, but eventually Kiptum told Kibet that Pete Watson, then the head coach at Auburn University, was headed to Eldoret in 2006 and was looking for athletes. Kibet met with Watson, who told him he would have to take some exams in order to run in the United States; if he didn’t score well enough on the exams, he would have to attend a junior college first before he could matriculate to Auburn. Kibet didn’t ace the test but still managed to secure a spot at Rend Lake (Ill.) College, a juco power, for the fall of 2006. Rend Lake won the NJCAA cross country title in his first year and placed fourth in his second year; both times, Kibet finished in the top five overall. But his impact at Rend Lake was felt well beyond the cross country course. Christianity was one of the three things (along with running and education) Kibet’s father stressed to him growing up, and he began attending services at St. Joseph Catholic Church in Benton, Ill. One day, Kibet shared his pew with a woman named Vickie Simpson, who immediately noticed the skinny Kenyan. “He looked like a little mouse sitting in the church pew,” Simpson says. Simpson felt compelled to talk to him as Kibet snacked on coffee and donuts after the service and Kibet revealed that he was struggling with an essay for his English class. Simpson, an elementary school teacher, offered to help him with it that afternoon. The two quickly hit it off. “I found him absolutely amazing,” Simpson said. It was a perfect match. Simpson, whose own children were both grown and married, was suffering from empty nest syndrome, while Kibet, who came over from Kenya with essentially nothing, needed someone to introduce him to American culture. He quickly became part of the Simpson family. He would take trips to the zoo with Vickie and she would drive him around if he needed to run errands. Vickie came to all of Elkanah’s races and at Christmas time, she hung a stocking for him. She even threw Elkanah a birthday party, something he never experienced in Kenya. Kibet had just as big an impact on Simpson. He loved cooking Kenyan food for her, and even if Simpson didn’t love the taste (“they boil everything”), she appreciated the gesture. Simpson was struck by Kibet’s kindness and generosity, but, more than anything, it was Kibet’s attitude that impressed her. Kibet was accepted to Auburn after his second year at Rend Lake, but before he left, he took what he learned from Simpson and paid it forward. Another Kenyan, Stephen Sambu, now one of the world’s top road racers, was new to the U.S. when he started out at Rend Lake in July 2008. Kibet quickly took him under his wing, teaching him the basics of college life: how to cook, how to do laundry, even how to train with the team. He even helped Sambu out with his schoolwork. Quite literally, the student had become the teacher. Kibet had a nice career at Auburn, but was never a star at the NCAA level. He ran NCAA XC just once, placing 23rd in 2008, and his best finish on the track was 7th in the indoor 5k in 2009. When he graduated in December 2010, Kibet owned PBs of 13:44 and 28:26. As a Kenyan, those times weren’t fast enough to earn a shoe sponsorship, but Kibet had made many friends during his time at Auburn and knew he wanted to stay in the U.S (Kibet has been back to Kenya once since coming to the U.S.; his mother still lives there but his father passed away in 1995). He lived in Kentucky for a year with Auburn teammate Ben Cheruiyot, training and selling shoes, but in order to stay in the U.S. permanently, he would need to apply for a green card or become a citizen. On Watson’s advice, Kibet joined the army, which would fast-track his path to citizenship (he became a citizen in October 2013). He entered the army with the idea that his racing days were behind him and that he’d simply run for fitness. But Kibet’s love for the sport was overwhelming. He realized that while he may not have been ready for a marathon, there were still plenty of races on the track and roads that he could train for. 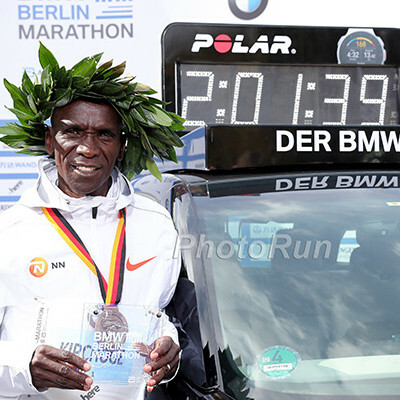 “In my mind, I was like, you can still do it,” Kibet said. He ran 13 races in 2011, setting a PB of 64:24 at the New Orleans Rock ‘n’ Roll Half Marathon. The next year was even better. Kibet visited Sambu, who was now training at the University of Arizona alongside Lawi Lalang and Bernard Lagat. The trip was eye-opening for Kibet. He could not believe how fit Sambu had become, and how fast his training mates ran on their recovery days. “When you’re training with Lagat, he never takes slow runs,” Kibet says. Though Kibet was dropped in workouts, he eventually adapted to the quicker pace and picked the brains of athletes such as Sambu and four-time Olympian Abdi Abdirahman for training advice. Upon his return home, Kibet had to take a few down weeks to recover from the tough training out west, but he incorporated what he learned into his own program, which was based on the program Watson taught him at Auburn. By the end of 2012, he had lowered his half marathon PB to 64:01. But 2013 was a struggle, as Kibet could manage SBs of just 14:29 and 29:43 on the track. The next spring was even worse. In March of 2014, he ran 14:35 and 29:48 in two track races. By that point, Kibet was almost 31 years old. He didn’t have a coach, let alone a training group, and his progress had stalled. If anything, he was going backward. Giving up would have been the logical choice. Yet Kibet couldn’t shake the idea that his best days were in front of him. He still harbored Olympic aspirations and Watson told him the best way to get to the Olympics was to join the WCAP. And to do that, he’d need to change his approach. Kibet had been hoping to make it as a track runner, but he didn’t have anyone to work out with and lacked the financial wherewithal to travel to the best outdoor meets, many hosted by Stanford. His other option was the marathon, but he had been scared of the distance for a long time. Shortly after leaving Auburn, Kibet had floated the idea of running a marathon to Wesley Korir, at the time a 2:08 marathoner (and eventual winner of the 2012 Boston Marathon). Korir told him that training for such a long race was incredibly difficult. “I just said, ‘Okay, I’m not going to do it,'” Kibet said. But now Kibet didn’t have another choice. He gradually talked himself into tackling the ultimate distance. There were only two small problems. Kibet had never run a marathon before. And he was about to serve a nine-month deployment overseas. 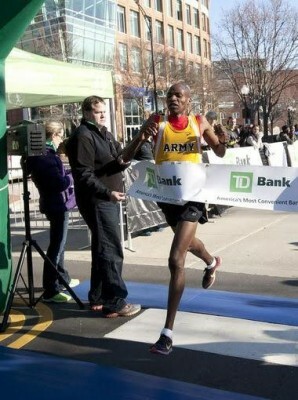 Kibet maintained a base level of aerobic fitness during his deployment, trying to log a minimum of six miles a day. But instead of sulking about how much training he was missing, Kibet told himself to remain positive and wait for his return to the States. 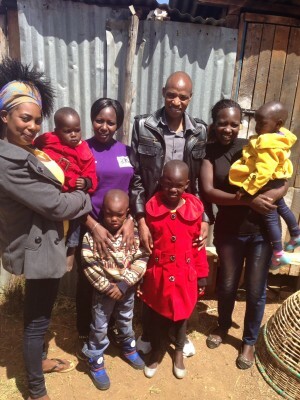 When Kibet came home in March 2015, he ran with renewed focus and vigor. In May, Kibet began training under Captain Rich Connaroe. Connaroe was preparing Fort Bragg’s team for the Army Ten-Miler in October and was happy to have Kibet on the squad. By training with Connaroe, Kibet was also able to skip his unit’s usual physical (military) training sessions. The two worked together well. On runs, Kibet would offer suggestions about how to tweak upcoming workouts; more often than not, Connaroe would agree and incorporate the changes. But Kibet wanted to do more than just run the Army Ten-Miler; he wanted to run a marathon. And once he was accepted into the Chicago elite field late in the summer, that presented a problem. 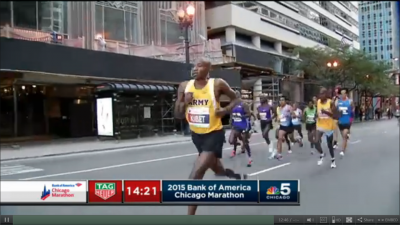 The Army Ten-Miler and Chicago were on the same day. Running both races would be impossible. Luckily, Connaroe and his commander realized the unique opportunity Kibet had at Chicago. 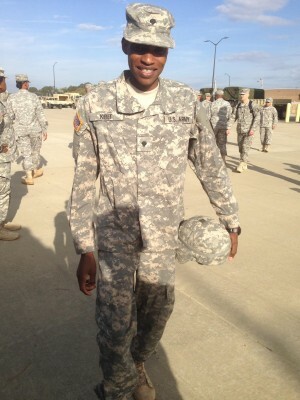 He would be allowed to train with the Fort Bragg team for the Army Ten-Miler. But when it came time to race, he would run Chicago. After running 70-80 miles per week for most of the summer, Kibet realized he needed to beef up his mileage and put together a marathon-centric training plan. It was only at the start of September — less than six weeks before the race — that Kibet really began training as a marathoner, consulting with Watson (now the distance coach at UVA who has guided his younger brother, Rob Watson, to a 2:13:29 pb in the marathon) and getting up to 110 to 120 miles per week. Despite the abbreviated buildup, Kibet believed he was ready to run 2:10. Connaroe and his other running friends cautioned him not to be so aggressive. Kibet would have none of it. He hadn’t tapered at all for the race at Virginia Beach and wound up winning the race by 39 seconds over Jeff Eggleston, a 2:10:52 marathoner. Three weeks later, Kibet ran the Lynchburg Ten-Miler as a tempo and led most of the way, taking second in 49:06 (2:08:44 marathon pace). 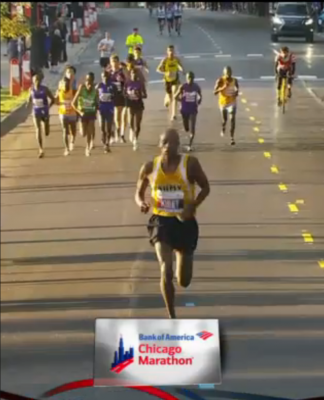 Kibet felt so good during those two efforts that he knew he was ready for a big one in Chicago. And if not for his inexperience, Kibet may have met his goal. Even after the leaders dropped him, Kibet still thought 2:10 was in the cards. At the 24-mile mark, he looked down at his watch and saw 2:00:00. Kibet ran in the low 5:00s for the final two miles, and approached the finish line expecting to meet his goal. He was surprised, then, when he saw his final time of 2:11:31. “I forgot it was 26.2 miles,” Kibet says. Kibet’s run in Chicago was terrific, and his time should be fast enough to get him into the WCAP, which will mean leaving behind his friends and comrades at Fort Bragg. Kibet knows that he has to go, however. He’s still got goals to achieve — he wants to break 13:20 and 28:00 on the track in addition to making Team USA in the marathon — and he owes it to himself to find out how good he can be. *Many result databases list Kibet’s birthday as 2/6/86 (February 6, 1986) but Kibet tells us he was born on 6/2/83 (June 2, 1983). Talk about Kibet and this article on our message board: MB: LetsRun, meet US Army soldier and Olympic marathon contender Elkanah Kibet. Elkanah’s amazing story earns him LRC Blue Collar Runner of the Month status.